I appreciate this opportunity to share with you about AMSOIL products and hope this presentation helps you see the value that AMSOIL products deliver. The superior ability of AMSOIL Synthetic oils to resist heat, friction and wear and the AMSOIL filters' ability to filter out the particle wear that occurs determines engine life and oil change intervals. 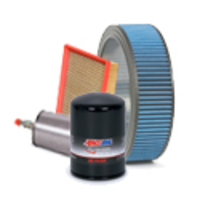 These benefits are greatly enhanced by the use of AMSOIL's EA ByPass filters which virtually eliminate engine wear by filtering to 2 microns at 98.70% as compared to normal filters which average between 20 and 25 microns. Click here to see the excellent mileage AMSOIL Dealer John Schlimmer's 1999 Chevy van experienced using AMSOIL Synthetic Signature Series Oil, Synthetic Transmission Oil and EA By-Pass Oil Filtration. For more information please look around this website (especially the Fleet page). I look forward to hearing from you. P.S. I've included more videos and information about AMSOIL products below. Need help deciding which account is best for you? We're more than happy to help answer any questions. Fights Engine Wear: These 3 words have been something we at Gratz Enterprises have said for many years. The proof is that independent testing has proved it – 75% more wear protection(a)! Protects Against LSPI: 100% protection(b)! Guards Turbo Engines: Protection that is 72% better! Promotes Oil Circulation: 90% better protection against sludge and 50% more detergents(c) to keep your oil ways clean and promote circulation!